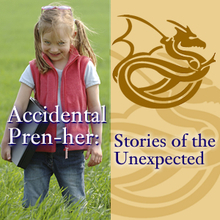 Today's special quest on The Accidental Pren-her Show, Stories of the Unexpected is Accidental Pren-her Marlene Trevisan. This 10 minute interview talks about Marlene's transition from the corporate world of CPA and CFP to the life of health and wealth coach with Isagenix. She has a brand new blog site called Launch Your Life where she posts health and wealth tips and ideas -- stop by and check it out! You can listen to Marlen's interview from your computer by clicking on the play button, download the MP3 file and listening on your iPod or other MP3 listening device, or read it in full below. Welcome to another episode of the Accidental Pren-her: Stories of the Unexpected. My name is Susan Reid, and we have as our guest today Marlene Trevisan, health and wealth coach with Isagenix. Welcome, Marlene, it’s so great to have you with us today. M: Hi, Susan. I’m so excited to be here. S: Me, too! We’re all excited here. So let’s talk a little bit about your journey into the entrepreneurial lifestyle. At one time, I know you were traditionally employed as a CPA and also a CFP (certified financial planner). And now – drum roll – you’re an entrepreneur and have been for about four years. So, take us on a short tour of your journey from traditionally employed to self-employed. When did all this begin? M: Well, actually, Susan, for me, it began with my first job out of college. I was with a large accounting firm as a CPA in Manhattan, and this was my dream job. My goal was to be a partner with this firm. I was on the fast track. I loved the work that I did, but what would happen is my manager would come to me on a Friday afternoon and ask me to cancel my plans for the weekend and work. And I thought, “You know what? I’ll pay my dues, and when I get to be a partner, then I’ll have more control over my time and this won’t happen.” So I began observing the partners in the firm, and what I noticed was on a Friday afternoon the client would come to them and say, “You know what? We need you to work on this thing over the weekend.” So they’d cancel their plans. And I’d hear their kids calling them and saying, “Daddy, when are we going to see you?” It was right then that I decided I wanted to be in business for myself because I wanted to be able to have more control over how I spent my time. S: That totally makes sense to me. Now, before you got involved with Isagenix, had you ever been a small business owner before? M: Yes, actually, I had. When my first child was born, I knew that I wanted to be able to be at home and raise him, and yet I still needed to earn an income. So, I was in that dilemma, and I really didn’t want to choose between raising my child or having an income. I was really determined to find a way to have both of them. Normally, in business you either have more money and less time or the other way around, and you have to make a trade-off, and I wasn’t really willing to do that. So I started looking for something that would allow me to have both of those. My answer was a vending business. S: A vending business? That’s interesting. Tell us a little bit more. M: What I did was I bought some small vending machines that I placed in local offices in my community that had drinks and snacks for the employees. And I hired a great guy who would come to my house once a week and pick up all the snacks and the drinks, and take them out and fill the machines and collect the money for me and bring it back. So while I was home caring for my son, I had my little machines out there all week selling these snacks for me. So, I was really able to accomplish my goal. S: Right! You had the best of both worlds. Oh, I like that! Vending machines…I love that one. And now you’re with Isagenix. What is the goal of your business now? M: The goal of my current business is to create an income that will provide my family with the lifestyle we want, time to be together, and to allow me to be a generous giver. I’m really passionate about supporting other women to become entrepreneurs and particularly to help them work their way out of poverty, and also to help other people have their own business so they can experience freedom in their lives. S: You know, now that your children are grown, it just really seems like you have come back to a place where you’re wanting to give to the community and helping other women, and I think that’s so wonderful. M: Absolutely. I’ve been so blessed to be an entrepreneur and to experience the benefits of that that I’m so passionate about helping other people do that. S: Yes. I can hear that in your voice. And now the coolest thing that has happened is just a couple weeks ago you launched your very own blog. Congratulations! S: Now, everybody who is listening, I want to let you know that Marlene’s blog is at www.braveheartwomen.com/launchyourlife/my-blog.html . I love that. It’s a long name and I’ve gone to visit your blog, and have really enjoyed the posts that you’re having about health and wealth and success and women supporting women. It’s a wonderful thing to see. So how did you choose to get involved with Isagenix? M: Well, ever since owning my vending company – I later sold that company – I’ve really been on a quest to find a business that would give me the leverage that I had in that vending business, you know, to be able to have both time and money. And I really wanted it on a bigger scale than I could get with the vending business. So I wanted to be able to earn a significant income, to have flexibility, to have time with my family, and time to help other people. And so when I found Isagenix, I knew that I had found my perfect vehicle. You talk about that Inner Samurai, and my Inner Samurai was doing cartwheels! S: I bet it was! M: Yeah, because I’m able to be in business for myself, but I’m not by myself. I work with wonderful people, and everything was already done for me. You know, the product was formulated, the manufacturing, the distribution, and even my website. So it made it very easy for me to get started and I also avoid a lot of the headaches that come with a lot of business ownership: I don’t deal with employees, I don’t deal with payroll taxes and things like that. The other thing that really impressed me with Isagenix was it’s the only company of its kind to earn a Congressional Award for Ethics in Business, and that was something that was sort of just “the icing on the cake” to confirm that this was the right place for me to be. S: From all that I know about you, I know that ethics are important. So it sounds like this business is a great fit. S: What do you enjoy most about what you do? M: I really love working with my team and coaching my team. Part of what I do is help other people develop their business and become successful, and in order to do that I really need to find out why they’re doing it, what’s the driving force for them, what are their goals and desires. So you really get to know people on a real personal level because sometimes those are conversations that they’ve never had with anyone else. A lot of times people have become so overwhelmed with “life” that they really haven’t thought about what they want in a long time, and it’s really fun for me to watch that spark ignite and begin to see people dream again. I really find it an honor to hold their dreams in my hands and nurture them, and to help people see them become a reality. That’s a big high. S: And that just seems to fit so well with your concept of really wanting to have an ethical business and partner with people to help them be the best that they can be. S: Well, we’re down to the last couple minutes in our radio show today, so let me ask you the final five questions that we ask everyone. Just be spontaneous and tell me what comes to mind. What one word describes your life today? M: I would say “intentional”. S: Intentional…that makes sense with everything you just shared with us. What quality or characteristic is most important to you now? M: It’s integrity. Integrity with the company I’m with now, and myself walking my talk. S: And that fits right in with your desire to be ethical. M: I would say it’s people not using all of their gifts and talents. S: And that’s something you inspire them to do, don’t you? M: I’m inspired by my family, you know, to just be a great example for them to use all of the gifts. And I’m really inspired to just be the best person I can be. S: You know, that’s the best kind of inspiration to have – inside-outside inspiration. The last question is, What’s the most precious thing you’ve learned along the journey from accidental pren-her to entrepreneurial woman? M: I’ve learned so many precious things that it’s really hard to narrow it down to only one. I’d say the first thing I’ve really learned is that deciding is the most important thing. When I set a goal – making that decision – it’s a done deal. M: Yes. I’ve also learned to accept myself, that self-acceptance is actually more important than self-improvement. S: When we accept ourselves, it seems like improvement is so much easier that way. S: And is there anything else? S: That’s very open-minded in your thought, then, isn’t it? S: Well, we’re at the end. Thanks, Marlene. It was just so wonderful to have this opportunity to chat with you and for you to share your vision, your life, and your goals with all of us. So thank you for being on the Accidental Pren-her Show today. If we have readers and listeners who want to get a hold of you, which I’m sure they will, tell us how they can get in touch with you. M: Absolutely. They can call me at 888-364-1892, or they can reach me by e-mail at marlenetrevisan@verizon.net. S: Thank you, Marlene. Those are wonderful ways for people to reach you. Does it matter which one, whether they call or e-mail? Which one? M: Either way. I’d love to speak with them. S: I’m sure they would love to speak with you! Thank you very much, and tune in next month for the next Accidental Pren-her Show. Hi Marlene! It was great to read your interview. How have you found your time desires changing and adapting as your children grow? If I heard you correctly, your children are grown, what have you changed in your routine as that time has become accessible to you? Congrats on your successful businesses and living your dreams! Thank you for sharing your story. It's very inspirational. Good luck to you! I love the theme of your story, Marlene, which you put so well at the end - "self-acceptance is actually more important than self-improvement." At that point, there are no limits! Hi Jeanne! I think as women and moms our lives are constantly changing. My kids are in college, middle school and high school so I have time during my day to devote to myself and my business. I take personal time for me right after they leave for school...exercise, journal, meditate. That is something I look forward to each day and I think it makes the rest of the day go better. Thank you for your good wishes Moschel. Dana, you are so right- at that point there are no limits! It is a challenge to reach that point of self acceptance and maintain it...but so worth it. What a wonderful treat it was to hear your story and learn more about your journey from Accidental Pren-her to successful business woman. It's a great story that is inspirational to so many women, Marlene! Wow, what an inspirational interview that was. I loved hearing about the path your career life has taken you and I sense such a groundedness about you that can only come from experience and such a positive outlook on life. I loved your comment about self acceptance vs. self improvement. And the comment about looking for the gift in your experiences just really resonates with me. I will certainly visit your blog and learn more about you there! 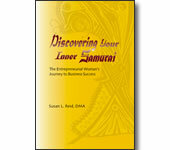 Susan says in her book that "starting up a business is a journey. A journey to the heart of the inner woman." I have found that my entrepreneurial journey has been a journey of personal growth. I suspect, Carol, from your positive comments that it has been for you also. Marlene, You are so spot on. Yes, this entrepreneurial journey was sparked by many things, but certainly my own personal "crisis" is what brought clarity about it as well... and that has led to so much growth and continues day to day. While in my transition of this family crisis, in the darkness of my winter, sparks of light had shown thru that spoke very strongly to me. Those that came not only to me as a mother, but to me as just a natural thing to do, to reach out to others in need. Yes, creating this business with my biz partner Lisa, has certainly been a journey of growth. And my own past and continued experience as a "family on the edge" creates such an inviting, yet humbling journey. I see everyday as a new beginning, renewed hope. I know I am so much stronger for it.